Help us name our kittens! There are two new cats in town. We’re happy to announce that The RE Store is growing by 2 tails! Long-time shoppers may remember Misha, our all black feline friend of 10 years. In 2015, Misha went home to a stable home cat-loving family leaving our store animal free. 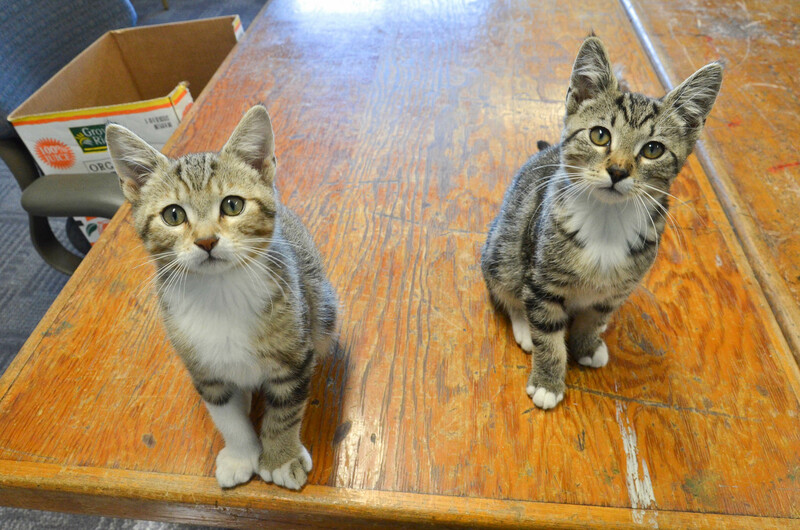 This fall while out on a donation pick-up, the salvage crew came across a litter of kittens and it wasn’t long before we brought home two tabby brothers. They’re being sequestered until spring when they’ll be of the right size and smarts to roam the store during the day. We need your help naming our two new additions! Our staff have already picked out a few pairs of names, and some single names floated to the top as favorites, but we’re leaving it up to you to choose the final names. Here’s a bit about them to help you with the naming process. Like any pair of siblings, the kittens are as different as night and day. While they are both have similar tabby markings, one is tan and the other is gray. The gray kitten is the more dominant of the two. It is more confident, quicker to relax or calm down, is more inquisitive, and seeks out attention and affection. The darker kitten loves being touched and will seek out laps to cuddle in. The tan kitten is the quieter of the two. It prefers to approach, rather than be approached, is a bit more skittish, and is slow to cuddle. 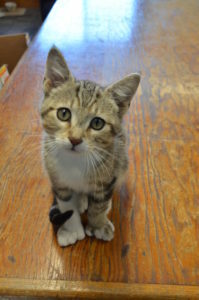 The tan kitten is also polydactyl, with 6 toes, instead of the normal five, on both of its front paws. In the photo above, the tan kitten is on the left, and gray kitten is on the right. To submit your choice of name, please visit the store. We’ll have a voting booth set up near the register where you can cast your ballot. We’ll have each name or pair of names on a mason jar. We’re asking voters to vote with a monetary donation to help us cover the costs of our new additions. Simply put a quarter – or a twenty dollar bill – in the jar of your choice. The name that garners the most money will be the winner. We will make the announcement at the end of the month, and you’ll be able to meet our new additions in the spring. 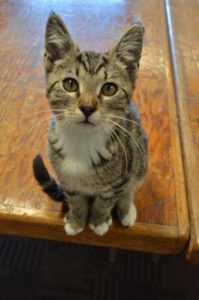 Be sure to watch our Facebook page for kitten updates.